This entry was posted in Substance Abuse and tagged Misuse, Prescription Medication, Treatment on August 24, 2016 by Team Addiction Hope. According to the Centers for Disease Control and Prevention (CDC), more than 8.5 million people in the U.S. use prescription sleep aids. At a glance, sleep aids can seem like the perfect solution to sleeping problems: Just take a simple pill and fall into a deep sleep within minutes. However, studies show that people who take sleep aids only benefit marginally compared to those who take placebos. For these minor benefits, are the possible side effects worth the risk? Many people who take sleep aids at night complain of drowsiness and impaired function the following day. This contrasts with the hope that sound sleep will make the person feel more awake and alert the next day. The effects of the sleeping drugs can linger in the system, making people feel tired in the mornings and even throughout the day – so much so that it may be dangerous to drive. A 2015 American Journal of Public Health study found that people who took prescription sleeping pills were twice as likely to be in a car accident as other people. Besides drowsiness, sleep aids can make people experience “hangover” effects such as dizziness and imbalance. This is an issue for older adults especially, and it can lead to dangerous falls and injuries. 16 percent of respondents admitted to mixing prescription sleeping pills with alcohol. 10 percent reporting using prescription sleeping pills along with recreational drugs like marijuana. Such combinations can alter the effects of the sleep aids, worsen the next-day consequences, and even be fatal. Prescription sleeping pills, especially of the benzodiazepine variety, are known to cause side effects such as amnesia, sleepwalking and sleep eating. After taking a prescription drug like Ambien, many people wake up and have no idea where they are or what they did the night before. Others notice food missing from their homes the next morning, with no recollection of waking up and eating. Meanwhile, sleepwalking can result in dangers such as falling down stairs or leaving the house in your sleep. Perhaps the most dangerous aspect of sleep aids is their addictive nature. Patients who take prescription pills long enough can experience “rebound insomnia,” or worsened sleeping problems after stopping the drug. This leads to people becoming addicted to the sleep aid or developing a dependency on it. Many users can build up a tolerance to sleep aids, which can tempt them into taking more than the recommended dosage. Taking a high enough dose of sleep aids can cause depressed breathing during sleep and possibly death. Sleeping pills are generally “sedative hypnotics,” a specific drug class that includes barbiturates and benzodiazepines. All benzodiazepines are potentially addictive, especially anti-anxiety medications such as Xanax and Valium. A doctor may prescribe long-acting barbiturates as a sleep aid, since they can cause sedation, but these drugs can be habit-forming. Patients may begin taking sleep aids during the day to calm their nerves or curtail hallucinatory effects, the latter of which can happen when an individual fights the urge to sleep. When a patient uses sleep aids in a way not recommended by doctors, it’s considered abuse of the drug. Sleep aids can exacerbate the effects of other substances and vice-versa. In this way, these pills can act as a gateway drug for teenagers with easy access to their parents’ medication stash. If you or someone you know can’t stop taking sleep aids or feels “withdrawal” symptoms without them, seek out a treatment center. 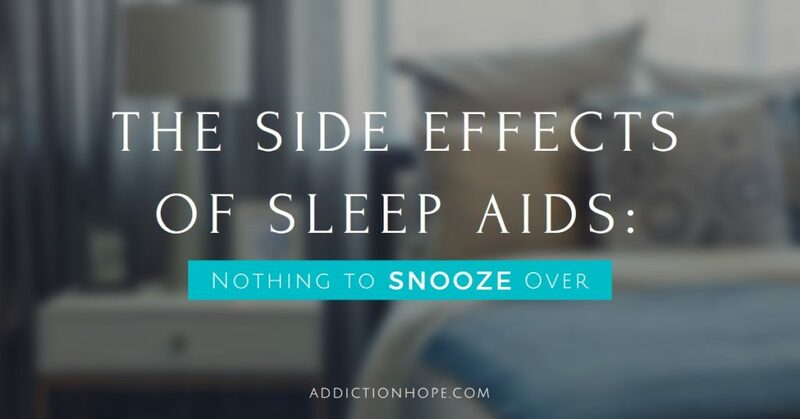 Sleep aid dependency and addiction are very real problems, and they often require the help of a rehabilitation center or treatment program to be overcome. Can you think of solutions to sleeping problems that don’t include prescription or over-the-counter sleep aids? Please share below.